Cairo - FIFA president Sepp Blatter called for tougher punishment for teams and associations found guilty of racism and discrimination on Tuesday and said monetary sanctions were increasingly ineffective. Statutes allowed for stiffer sanctions which now had to be implemented as the battle against 'the scourge of racism and discrimination is not being won', he told the Confederation of African Football congress. "We have to punish not only through fines and stadium closures but we have to use our rules to suspend teams, to take away their points or even to relegate them if racism continues," Blatter said. Blatter reminded African countries of extensive financial support to the continent's football associations from world football's governing body as he opened the congress in a Cairo hotel on Tuesday. Blatter, who is expected to get extensive support from the continent's 54 countries when he stands for re-election next month, said FIFA had spent some $700 million on various programmes across Africa. "We should maybe spend more to prepare a better future for the children," he added, mirroring the promises of his three rivals in the FIFA election for more financial assistance for member countries. 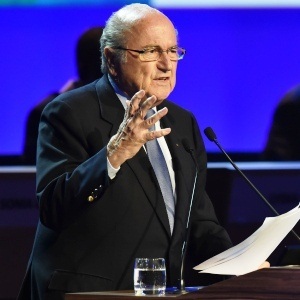 Blatter was met with a warm ovation from the African delegates in contrast to having to sit through stinging criticism when he attended the UEFA congress in Vienna last month. Tuesday's CAF congress was also attended by Prince Ali bin Al Hussein of Jordan, Dutch Football Association President Michael van Praag and former Portugal international Luis Figo, who are all standing against Blatter, but they were not permitted to address the assembly. CAF president Issa Hayatou, who last year pledged his members' support to Blatter's bid for another term in office, repeated his call for Africa to back the incumbent. "He has been a faithful partner and in Africa we acknowledge our friends and offer them that they deserve," added Hayatou.